Finely chop 6 sticks of celery and slice 4 Waitrose Ready Roasted Chicken Breast Fillets into bite-sized pieces. Mix with 55g slivered almonds and 1 x 85g bag of watercress. Peel and segment 2 oranges. Mix any juice with 6tbsp Waitrose Honey & Mustard Dressing and lightly stir into the salad. 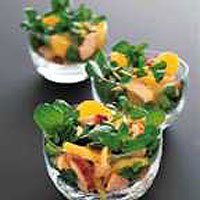 Arrange the orange segments on the salad and serve with crusty bread. For dessert serve orange slices or segments with halved fresh dates and a crumbly cheese, such as Wensleydale, at the end of a meal. This recipe was first published in January 1999.